We add a mini player to the MVC variant of the sample app found in our App Architecture book. 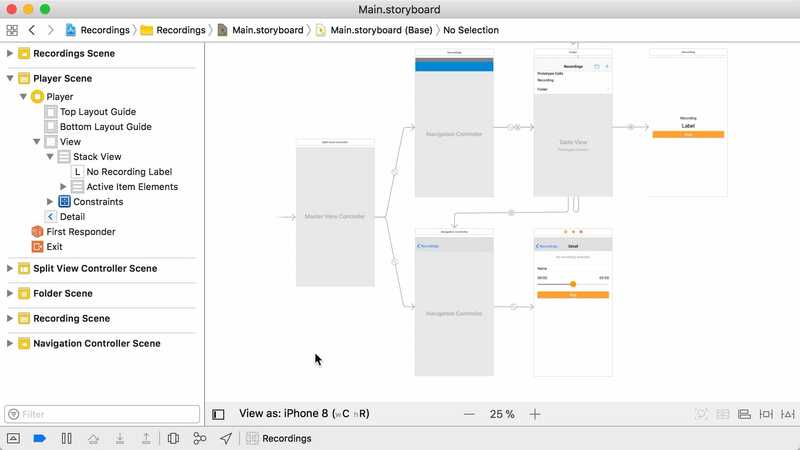 We adjust our storyboard and discuss how to adapt the architecture. 00:06 We recently launched the early access version of our new book, App Architecture. Today, we'll add a new feature to the example app from the book. 00:24 The app lets us record and play back voice memos. The recordings are saved in a folder structure, which we can freely organize by creating new folders and subfolders. When we select a recording, it opens in a simple player. 00:58 In the book, we wrote out a simple voice notes app in various architectural patterns, but adding a feature might work differently in each architecture. Today, we're working with the MVC version — the most commonly used architecture in Cocoa — and we'll see what we need to do in order to implement some changes. 01:20 Currently, a selected recording is played by pushing a new play view controller. When we exit this view controller, playback is stopped. It would be nice to add a mini player at the bottom of the screen that keeps playing the selected recording while we browse the folders. 02:21 For the new version, we want to wrap this entire split view controller in a new container, which will be displayed at the top of the screen. At the bottom, we'll have another container holding the mini player. As a first step before updating our code, we're going to draw out these changes in the storyboard. 02:54 We add a new view controller with two container views: a large one on top, and a smaller one for the mini player at the bottom. Using layout constraints, we pin the container views to the superview's edges, we add a vertical constraint between the two, and we give the player's container a fixed height. 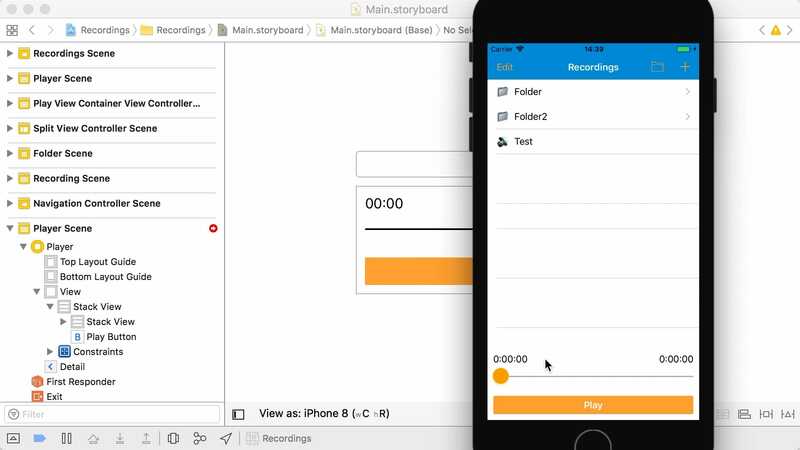 06:57 We update the type of the root view controller in our storyboard, run the app, and see that everything works the same way as before, with the addition of a blank space where the mini player will go. 07:31 As a side note, we should mention that the sample app also supports iPad — hence the use of a split view controller. We are ignoring this fact in today's episode and instead focusing on the layout on iPhone. 07:50 The next step is to present the play view controller modally instead of pushing it onto the navigation stack. Back in the storyboard, the player is opened via a segue. We change this segue's kind from "Show Detail" to "Present Modally." This makes the player show up from the bottom of the screen. 08:37 We need a second player to go into the empty spot of our root view controller. We duplicate the play view controller in the storyboard, removing some of the subviews not needed for the mini player, like the text field and the label for the name of the selected recording. 12:33 Now we can open a recording and tap "Done" to close it again. 12:40 With these changes in place, we've constructed the new layout of our app and we're ready to update our code and make the mini player actually work. To figure out what needs to be done, we take a more detailed look at the MVC architecture of the app and how the player is currently implemented. 14:31 All folder view controllers talk to the same Store instance, which is a singleton. This way, the view controllers can indirectly communicate with each other through the model layer. So, for example, when we delete a folder in one folder view controller, the change can be picked up by all the other folder view controllers as well. This way, if we scrub through the timeline on the modal player, then the mini play view controller knows to update its views too, since it's observing the same player. 16:55 There's a bit of work ahead of us to make a single, shared player. We'll need to extract the player code and create a shared instance somewhere. When a play view controller appears, we need to populate it with the player's current information. And the view controller needs to observe the player in order to stay in sync. 17:22 Quickly glancing over the PlayViewController source, we see that the code dealing with the player and the UI is all entangled. The UI code has to stay in the view controller, but all player logic should be extracted and moved into the model layer of our app; the shared player shouldn't know anything about UI. 18:38 How exactly we make the described changes is dictated by the app's architecture. In the book App Architecture, we look at how this app's implementation is very different in various architectures like Elm and MVVM-C. In next week's episode, we'll continue to look at the MVC implementation.